No fewer than 74 persons have lost their lives following the flood disasters in parts of Katsina, Kaduna and Jigawa states. 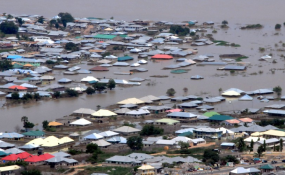 The North West coordinator of the National Emergency Management Agency (NEMA), Mr Ishaya Chonoko, who revealed this yesterday, said that many lives were lost to flood in both Katsina and Kaduna states, while 30 others had been missing in the last four months. According to him, the agency recorded 51 deaths in Katsina State, two in Kaduna State, while 30 persons were confirmed missing in Jibiya, a border town in Katsina State. This is in addition to 21 deaths recorded in Jigawa State, where over 546 communities were devastated by the natural disaster in 14 local government areas of the state. The NEMA coordinator in the zone said a total of 12, 041 persons and 262 houses were affected in Katsina State, while 3,775 houses and 7,929 farmlands were similarly devastated in Kaduna State in the floods that occurred between May 3 and September 8, affecting 29 local government areas in the two states. He listed the affected areas in Kaduna State as Abubakar Kigo road, Tudun wada, Malali, Ungwar Rimi in Kaduna North, Barnawa in Kaduna South; Karatudu, Narayi, Rido village, Gonin gora and Sabon Tasha in Chikun; and Hayin Na'iya, Rafin Guza, Hayin Dan- Mani and Kawo in Igabi LGAs. Areas hit in Katsina State include Malumfashi, Kafur, Bakori, Kusada, Kankai, Rimi, Musawa, Daura, Baure, Maiaduwa, Dutse-ma, Batsari, Kaita, Zango, Sandamu, Kurfi and Faskari LGAs. Chonoko said the agency had distributed relief materials to flood victims in the state, including blankets, corn, rice, mattresses, cement and detergent, which constituted the immediate needs of the victims. The agency attributed the flood to blocked drainages, constructions along water channels and illegal mining along river banks. According to Chonoko, the incident came days after the state emergency agency, SEMA, and the Kaduna State Environmental Protection Authority (KEPA) issued an alert that some LGAs in the states were likely to experience flash flooding. He said the agency had always embarked on sensitisation campaign in flood prone-areas to warn the residents on the need to relocate to safer places, in view of the predictions of Nigerian Meteorological Agency (NIMET). He, however, expressed confidence that the Kaduna State government had made adequate arrangement to cater for potential Internally Displaced Persons (IDPs) in the flood-prone areas. Meanwhile, 21 people have died and hundreds of pregnant women and other patients with different ailments are cut off from access to medical services as floods cut off over 546 communities across 14 local government areas in Jigawa State. When LEADERSHIP Weekend went round some of the affected areas, youths and other members of different communities were seen working day and night to construct embankments around their communities to reduce the flood devastation. One Malam Adamu Mai'unguwa of Budamai village, who arrived Harbo Sabuwa village from Budamai village on a canoe carrying pregnant women and patients for transportation to Jahun Hospital, said they spent three hours rowing on the flood water before reaching the road. He said they only managed to convey patients with more urgent needs as the journey from their village was a tortuous and risky one. "Our village, with a population of over 1500 people is completely surrounded by water and all roads are submerged by the flood. We can only reach the road after spending three to four hours on the canoe which we were not used to before," he said. In Miga local government, the chairman of the council told the deputy governor of the state, Ibrahim Hassan Hadejia, who was on an inspection tour of the affected areas, that the flood had kept rising in the last seven days and that the people of the area had been having a hard time trying to limit the damage. He noted that the local government had distributed thousands of sacks in different communities which they were using to construct embankments to protect their communities from total submerging by the flood. In his speech, the deputy governor said the state government was currently assessing the situation so as to come up with a strategy for lasting solution, in addition to immediate palliative measures. "The government will also send a mobile team of medical personnel to reach out to the affected communities for treating the sick ones. We will also buy 100 canoes for those communities that are cut off from any access road. "When the flood subsides, we will provide farmers with improved seeds that can be harvested within two to three months for them to grow them in order to reduce the difficulties they may face as a result of the flooding," he said. The deputy governor also called on the federal government, companies and all other individuals to come to the aid of the flood victims.